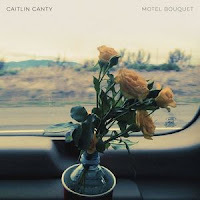 Vermont native Caitlin Canty released her third album Motel Bouquet on 30th March. The singer-songwriter's third album, Motel Bouquet sees Caitlin's Americana style come to the fore on the 10 tracks that form the release. What was your first experience of music growing up? That would be singing to my parent's records, probably like any other kid - or to the ones they picked out for children, the "We Sing and Play" [laughs] That's what I'm told is my first experience. I remember singing to Simon and Garfunkel records and cartwheeling around on their blue carpet in our apartment! I think that's the first time I remember singing. You describe your music as carving 'a line through folk, blues and country ballads', how did you come about that sound? I'm a song-writer first, I love a song at it's bare bones, whether it's just being sung or played solo. A lot of songs are later dressed up and move into their genre category, a folk song might be called country if it's got pedal steel and fiddle on it. A lot of my music is informed by the music I love of course, that's led me down this path, Tom Petty and Lucinda Williams and Bob Dylan and Johnny Cash, the songs that they write and sing just always hit me so hard. Years ago I got obsessed with trying to figure out what made those songs move me and I'm still obsessed with trying to figure it out! You recorded your new album Motel Bouquet over only three days, did you find the short length of time influenced the recording process at all? Absolutely...a cornerstone of the way I like to record music is to try to keep it as close to the way a live show feels as possible by recording over just three days - my last record was four days - I think it gives us the time to dig into songs but the playing and the singing is live, it's not overdubbed and it's not pealed away and assembled later - so a record is in a place, in a time and in a singular frame of mind. To me that helps it feel like it's a record, it's not just some songs that ended up being printed on the same piece of vinyl. I've tried making it many other ways, I've tried overdubbing vocals, I've tried building records from the base and the drums all the way up to singing at the end. I think the way I've felt is most satisfying in that moment to make the record and the way I like the products the most is to do it live, it doesn't let you mess or tinker with too much with what happened. If there's passion in the room, if there's that fire and joy in the room whilst you're making music and you feel it in the song, the easiest way to get it to come across I feel is to be live. It gives you the pressure...being able to do it in a studio and have a couple of takes or round out the sound with the band and have everyone bring their ideas to the table, that happens in a live setting in a studio, on stage you get one shot and then it's on to the next. It's a beautiful line between a high-pressure cooker and just really relaxing in a natural way to do it. I personally am a touring musician and a lot of the people I play with, we spend all of our nights in front of a microphone, in front of an audience sharing our music with the others onstage and with the audience, on a beautiful feedback loop. Sometimes in the modern recording process it becomes very sterile and pulled away from that sort of beauty, race to perfection has become the ideal and to me that's not the ideal. Do you find you have a different relationship with the musicians because of that? This record for me stands apart from other records I've made. It's the first record I've recorded upon moving to Nashville so it's the first record in my new hometown. Some of these musicians I've played with a lot, I've either done some live shows with them or I had written with them or I had played with them in a living room. I had seen all of these musicians play on stage - especially at The Station Inn which is one of the great bluegrass country venues left in Nashville - and then a lot the these additions were either in bands together...like two were in Punch Brothers...two of these additions had toured in Sheryl Crow's and KD Lang's bands...there was a lot of these connections with what felt like brothers and then a lot of people who were playing for the very first time together - even if we had known each other or been aware of each other's music so that was a really cool relationship to have when making new music. To have this feeling of comfort but also people were nervous because it was their first time playing with Stuart Duncan, they wanted it to count. I think the difference...the band who played on "Motel Bouquet"...they are just enormous talents and folks who could tun on a dime, who are able to bring their own ideas to the table but there's no ego that gets in the way. They were such tremendous support but also could really lead the way when asked or when the song needed it. It just felt like the lack of ego is really what struck me. When you have people who are such well-known individual talents who can still be supportive and really contribute and bring the fire to a session in Nashville...these guys could play a session any day in Nashville but it felt special, it was really not another day in the office. It's like choosing your favourite child! [laughs] I tend to gravitate towards anything in a minor key or sound, "Scattershot" and "Who" were two of my favourites. I wrote "Who" in a different way than I usually do, I had the words and tried on a lot of different arrangements and musical processes, different chords, different grooves...I tried a lot until I found what felt like the chords that really stuck. I tend to write some songs that are a rambling river of words, tumbling over each other...I'm currently writing out some hand-written lyrics to songs for some pre-order folks and I'm realising there's a lot of words in some songs! I'd say the harder songs to write are the ones that are just honed to the most minimal and I felt like I could say a lot in so few words with "Who" without pinning the story down to a certain point of view. I remember it was the last song we recorded in the studio and I just remember feeling like I couldn't believe that that just happened on my song, it was such a happy moment in a sad song. This new release is your third album, how do you feel you've developed as an artist since your debut? Well my last record "Reckless Skyline" was in 2015 and I toured more heavily than I had and I opened for a lot of artists, Milk Cartoon Kids and Darlingside and Gregory Alan Isakov, Anais Mitchell and was in front of their audiences and I also toured in front of my own audiences and circled back to places I loved. I played in Europe for the first time and I was just out in England with Darlingside before this record came out so there was certainly a ramping up in the touring and a widening of the types of shows I played. I think it's the way I write songs. If I'm only at home writing songs that no-one else can hear that's a different thing to going out and road testing them, a new song in a new environment, playing it at sound-check, playing it for your friends, all that heart of touring went into this album. The other development would be moving to Nashville, to Music City. Not moving here in order to set up a studio on Music Row but to be in a place that makes it easier to make music and easier to fly - my airport is twelve minutes from my house, that's a nice thing when you move around a lot! And there are musicians! That's the practical side of me but there are so many musicians here who are always around for 'hey can you come sing a backing vocal' or 'finish up a song I'm having a hard time rounding off', there's just folks that actually hang out in their backyards with their guitars on their porches and that really does feed into my development. For me I'm a lot closer to nature, I get outdoors a lot more than I did when I lived in New York City. So I'm just closer to music and closer to the stuff that fills the tank which is nature for me. I would like it to take me back to the UK! [laughs] I can't wait to put something on a calendar. I hope it's more if the same. I look around and I get asked often 'how does a musician survive in this modern streaming age?'. I spend a lot of time talking about that, how you can grow and grow your career but the pie is maybe shrinking as your piece of it is getting bigger. I feel like it's a victory to make music and enjoy doing it, to be able to do it as a full-time job. I love it and I want to do more of the same. Which track from any of your albums do you feel best encapsulates you as an artist? My mum is a school teacher and every year they have this 100 day school where they would have this woman who was 100 years old, then 101, then 102...I think she lived to 104, in Proctor in Vermont. She would come in and talk to the kids and my mum loved her advice. Her name was Ida May and every year she would come in and tell everybody...they would want to know 'how do you live so long', 'how do you stay so happy as such an old lady' [laughs] and she would say 'just keep moving'! That was her advice and I just love that. I think it's true, no matter what state you're in keep moving. What's your favourite thing about working as a singer-songwriter? I think my favourite thing is the ever growing number of hometowns I feel like I get to spend a lot of time driving around the US and I get to see the country in a way that is not through our screen of what Facebook is telling us is going on out there or whatever the news is telling us. It is wonderful to get to drive around and meet people. When people come out to see a show they are probably on different aisles of the political spectrum but when they come to a show it feels like they are, at the very least, not at home staring into their screens, not connecting with the world outside. It feels like the differences fall away...when you're in the same room and listening to the same music there's something that's shared, it's really cool.I always feel like a favourite cousin or aunt who rolls through town once in a while and I'm like part of this temporary family in Idaho or in Maine, just different corners of the country, I get to see my people again, the fans who've come back every time I come around, it's just a really cool family to be a part of and way to see a country. Probably all of the pieces that don't involve playing music or writing music! [laughs] Which is a big chunk! My least favourite part would probably be the emailing and the calendar dance that it involves. Are there any plans to play a headline tour in the UK? There are hopes and dreams, there are no solidified plans. It's on my must-do list, it's the top of my 'why is this not on the calendar yet' [laughs] things for my team. It'll definitely happen, it's my priority. I just don't know when or how, it's hard to go across that big body of water! [laughs] You'd need a jet plane to take you there unless you're playing more than one show! I've got to make sure I do it in a way that counts, a real tour not just a one off stage. It'll happen! The best way to keep a track would be the website or BandsInTown, my mailing list is a good way to know first. Thank you for Caitlin for her time! Motel Bouquet is available now, keep an eye out on Caitlin's website for any upcoming tour dates.